This area is as much about atmosphere as sightseeing, so take time to soak up some of that Left Bank feeling. Begin on the Quai de la Tournelle, strolling by the booksellers here and on the adjacent Quai de Montebello, which runs parallel to rue de la Bûcherie home to Shakespeare and Company . 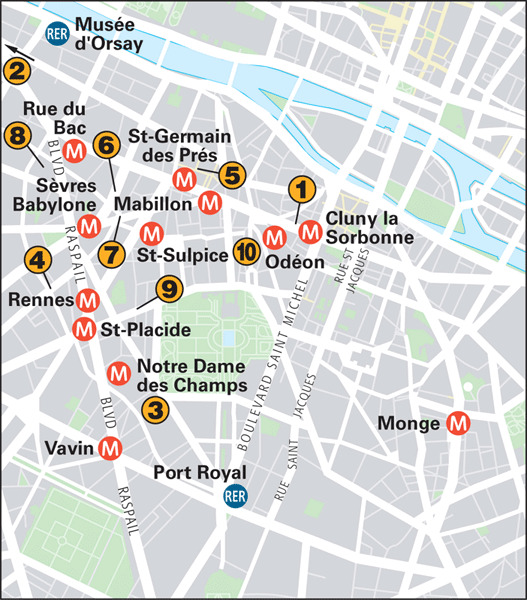 From here head south down any street away from the river to the busy boulevard St-Germain. 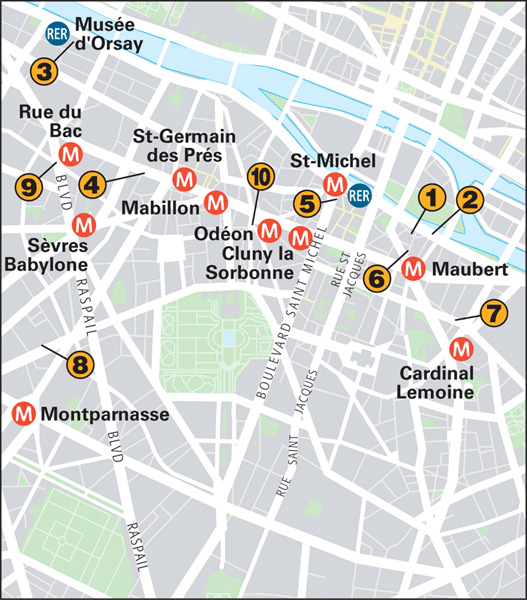 Turn right for two famous cafés, the Flore and the Deux Magots, and stop for a break among the locals talking the morning away. 01 42 22 01 60), a bistro full of Gallic atmosphere. The later you reach the Musée d’Orsay the less crowded it will be. Spend an hour or two exploring the collection. The most popular displays are the Impressionists on the upper level. 01 53 63 15 15).Or if it’s dinner time, stay at the Musée d’Orsay and indulge in their set menu (Thu only). 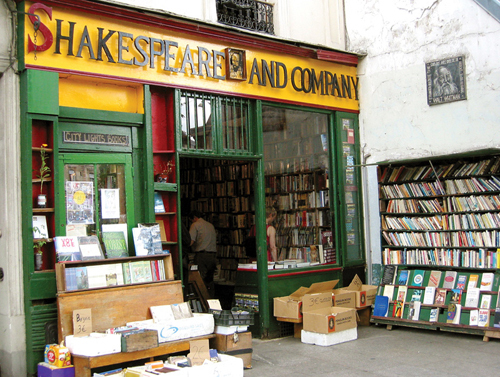 Bibliophiles spend hours in the rambling rooms of Paris’s renowned English-language bookshop. There are books in other languages too and regular readings in English and French. 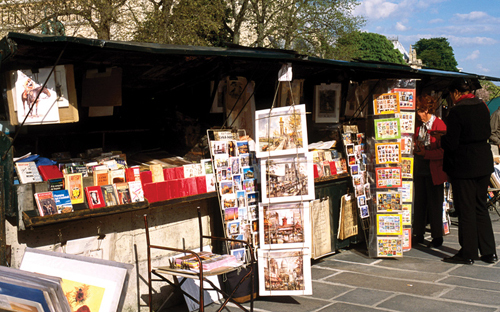 The green stalls of the booksellers (bouquinistes) on the quays of the Left Bank are a Parisian landmark. Pore over the posters, old postcards, magazines, hardbacks, paperbacks, comics and sheet music. As well as its wonderful collections, the museum has a bewilderingly large and busy art bookshop . Renowned literary hang-out. Good collections on art, photography and literature. A cluster of bookshops that sell everything from travel guides and French literature to cookery books and children’s stories. Specialist in comic books, which are big business in France, from Tintin to erotica. Specialist on books on Africa, as the name suggests. Good information point, too, if you want to eat African food or hear African music. An excellent venue for a relaxed afternoon’s browsing among thousands of English-language books; you can have a cuppa, too. Specialist in books on art adjoining the Maeght art gallery, with a good collection of posters, postcards and other items. North American bias, but works by writers from around the world as well. One of a new generation of chocolatiers, Patrick Roger already has legions of fans thanks to his lifelike sculptures and ganache-filled chocolates. Michel Chaudun produces chocolates so divine that le tout Paris drops by in chauffeur-driven cars for a regular fix. 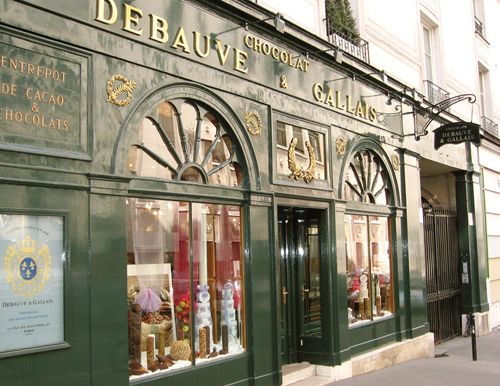 Another of Paris’s distinguished chocolatiers. Elegant, minimalist presentation and superb flavour combinations. Founded in the 1930s, this tiny bakery produces rustic, naturally leavened loaves in a Roman-style, wood-fired oven. The owners of this English-speaking wine shop, which has a good selection of bottles from small producers, also run the nearby wine bar Fish. This shop dates from 1800 when chocolate was sold for medicinal purposes. Here are some of the city’s very finest cakes and pastries, including what is said to be the best chocolate gâteau in Paris. Wine shop specializing in fine Bordeaux, rare spirits and sparkling champagne. Aoki cleverly incorporates Japanese flavours such as yuzu, green tea, and black sesame into intoxicating classic French pastries that taste as good as they look. Here you’ll find some of the finest pastries in Paris, along with some truly miraculous macaroons.